I don’t know whether something went wrong with mixing, mastering or maybe just during the album’s pressing but a buzz has built up online over many people hearing static throughout the songs. I held off on getting the album because of this problem yet other people say their copies are fine, so I eventually took a gamble and ended up buying it. I put it in my computer and it played fine. The next day, I put it in my car stereo and that’s when the static pops up. I check the disc and there’s tons of scratches on it. The static ranges from small crackles you might hear on a distant radio station to full-blown fuzz that totally dominates depending on the track you’re listening to. So then I get home and pop it in my computer again and it plays perfectly. My copy of Metallica’s Death Magnetic had a similar issue (with an entirely different car). What is going on ?!? This is pretty annoying and I think there is no excuse, given technology these days, that an album is defective like this. Whether this problem began in the studio or at the manufacturing plant, someone is getting paid to catch mistakes like these and they obviously weren’t doing their job on this occasion. Luckily, it just so happens I listen to most of my music on my computer but it is still nice to have options, especially when the album is brand new and I want to listen to it whenever I can. Basically, to my ears, this is pure old school thrash and that’s the way I like it! “The Green and Black” and ‘Ironbound” (my favorite song off this album — great middle part) especially bring to mind ’80s thrash and the first four songs in particular are all very good. 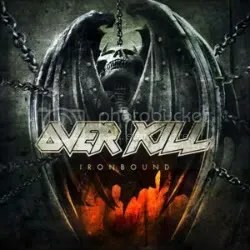 I don’t know how this compares to the rest of the band’s catalog but as a first-time listener, I am very satisfied and will be seeking out more Overkill albums. Also, I love Ellsworth’s voice. He’s like a really ticked off and rougher sounding Bon Scott and all of this comesafter having had a stroke! Just amazing.